Today is St. Patrick’s Day, a day of celebration of Irish history and culture. As food is a building block of every culture, I felt inspired to try out a traditional Irish recipe I found on the Maine SNAP-Ed website. Colcannon is a dish made from potatoes with either cabbage or kale and other vegetables mashed into it. It is hearty, nutritious, and inexpensive to make. This recipe calls for red potatoes with green cabbage. 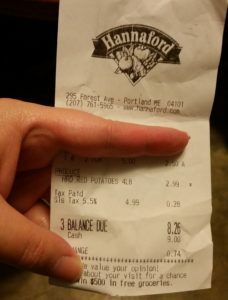 I purchased a 2.5lb head of cabbage at $0.59 per pound which came to $1.48, and a 4lb bag of red potatoes for $2.99. I already had all of the other ingredients (onion, butter, milk, spices) on hand. 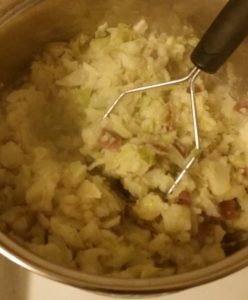 The recipe only used half the head of cabbage and one pound of potatoes, so I was left with cabbage and potatoes I can use later in the week! 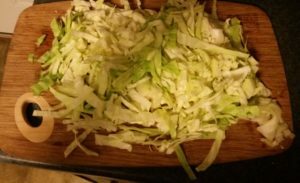 Using a clean cutting board, I cut the cabbage in half, stored one half in the fridge. With the other half I had out, I carefully sliced it into very thin strips. 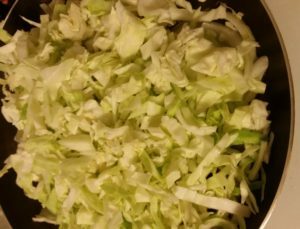 I learned that cabbage is tough, so you need to be careful when cutting it. 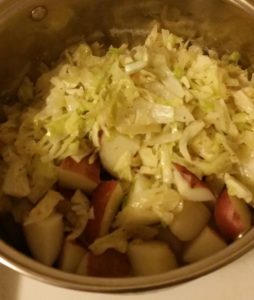 I set the cabbage aside in a bowl while I continued prepping the other ingredients. I chose a little over a pound’s worth of potatoes from the bag, which was 3 potatoes, each roughly the size of a tennis ball. I then scrubbed them under cold water, and chopped them into medium sized chunks, roughly the size of ping pong balls, rinsed off the extra starch, and set them aside. 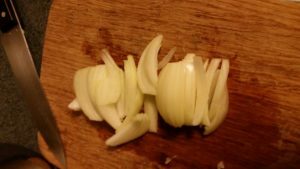 I then took a medium onion, the size of a tennis ball and sliced into thin strips like the cabbage. Now with all of the vegetables prepped, I was ready to start cooking. First, I put the potatoes in a pot of water and placed it on the stove to boil. Then, in a medium fry pan, I started sautéing the onions with a bit of butter over medium heat. 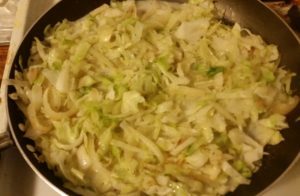 After a few minutes when the onions were soft, I added the chopped cabbage. At first it almost overflowed the pan! I learned I had to flip carefully with my spatula. 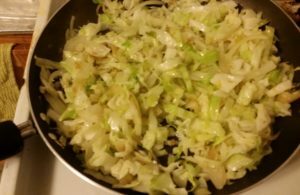 I ended up sautéing the vegetables for longer than it suggests in the recipe, because I wanted to really cook the cabbage down. I was carefully stirring the mixture every few minutes so it did not burn to the pan. Here’s what it looked like after about 8 minutes. Then I added one cup of milk to the pan (1%, fat-free milk, or dairy alternatives like soy milk will all work perfectly in this recipe). As it came to a gentle boil (small bubbles), I added black pepper. I left out the salt as called for in the recipe as a personal choice and replaced it with garlic powder. …and mashed everything together! As I mashed, I carefully poured a little potato water back in a little at a time. I do this every time I mash potatoes and it makes them nice and fluffy without using extra milk. Each batch needs a different amount of water, and this time I used about a cup. As I mashed I realized that the potato skins and the cabbage do not fully break down. Instead they add nice color and texture to the potatoes. 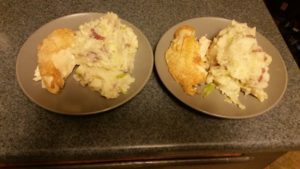 I served the colcannon alongside pieces of a rotisserie chicken we bought for around $5. We chose to leave the skin on, but you can easily remove that for a lighter meal. With these servings, we had ½ the pot leftover, so this recipe could have served a family of 4. My partner loved it and said that he would like to have it on the menu again. At roughly $0.75 per serving, I’m happy to make it anytime.